Synopsis: With Bedstar you can find a range of brilliant beds that will allow you to relax after a long, stressful day. TV beds have exploded onto the market a few years ago, driven mostly by becoming more affordable to mainstream consumers. In the early days due to the complexity and the technology involved in raising a TV from the footend of a bed it was considered a real luxury product, retailing for £5000.00 and over. Nowadays the technology has become much cheaper to produce allowing models for a little as £500.00 to enter the market. Universal brackets allow for any type of TV to fit into the footboard as long as it falls within the required measurements which will be supplied with the bed. Finding the perfect bed is essential for anyone. We all know the health benefits that a good night's sleep can provide, meaning it's so important to get a comfortable bed to suit you and your needs. With Bedstar you can find a range of brilliant beds that will allow you to relax after a long, stressful day. However, you don't just go to your bed when it's time to sleep. Many people will have a TV in their room, but it can be awkward to find the right spot to get comfortable and watch your favorite TV shows or play on a gaming console. But, it's not anymore! That's because we specialize in TV beds, which are an impressive addition to any bedroom. Intricately designed and fitted into the end of the bed, a press of a button will see a TV effortlessly come out from the footboard. From there, it will be perfectly positioned to allow you to watch all of your favorite programs without having to move a muscle. Then, once you have finished watching TV, it will slot back into the footboard, it really is a simple process. There will be no need to sprawl yourself across the sofa or any twisting and turning to find the right angle to watch the TV. It's comfortable and convenient, designed to create the ideal platform for any of you who watch TV in your room. Equally so, you can hook your console up to it and you've got the perfect set-up! 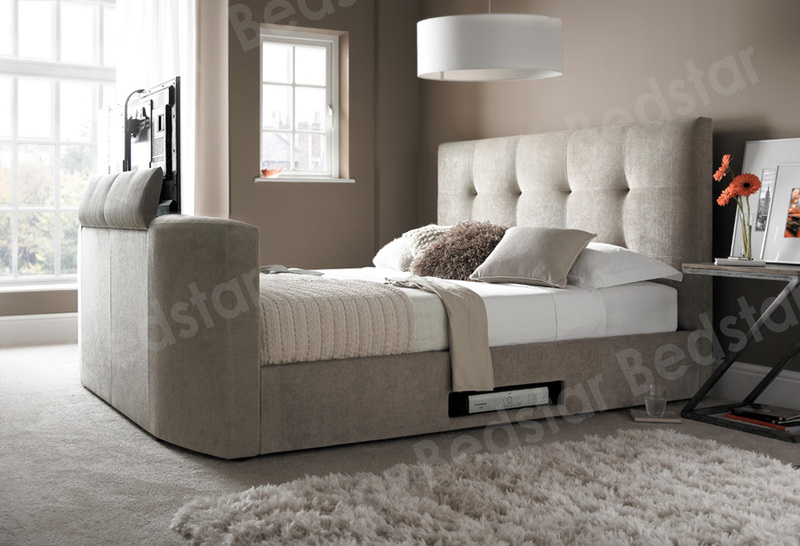 What's more, there's no compromise when it comes to the style or design of the beds, they are still top quality. As with all Bedstar beds, there's plenty of choice when it comes to deciding which TV bed is for you. Firstly, the sizes, there are single, double, king-size and super-king-size available, ensuring that you won't be restricted with your choice. 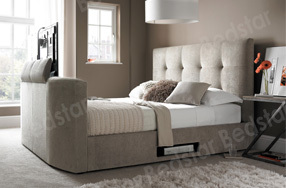 Next, there are a range of different styles that are available, with a standard TV bedframe or Ottoman all available. 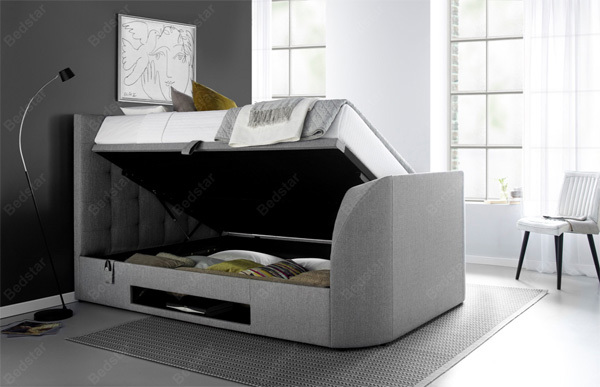 The Ottoman beds also provide some much-needed space with the storage room that is accessible. Furthermore, there are two and four draw options, if you require the added room. There's also plenty of choice when it comes to the colour and finish that you want. Faux leather, real leather and fabric are available, along with a host of colours that will easily fit into all types of designs. Are you going to keep it safe with a black or brown TV bed? Or does that not reflect your style? Would a red or blue bed be much more appropriate? Either way, there's much to choose from. With the growing popularity of larger TVs, and crisper sound some TV beds can now fit a 42" television with some models including a sound bar and speakers built into the headboard offering a genuine cinema experience. Ultimately, if you're looking for the perfect bed with TV combo, then Bedstar is the place to visit. With such an extensive range of TV beds, you will be spoilt for choice. Instead of watching your TV on the wall, or not having one at all, treat yourself to a luxurious TV bed that combines comfort and entertainment. One of our most popular model is the Barnard TV bed with built in ottoman storage and enough space for a whopping 42" LED TV. Remote control operated so with the touch of a button you can be watching the latest Netflix film in no time! The Barnard is available in either light or dark grey fabric.